choices can sometimes seem overwhelming. Fortunately, online marketing is also very logical, as long as we learn how be a proactive pioneer. Journeys go more smoothly with a map and directions. 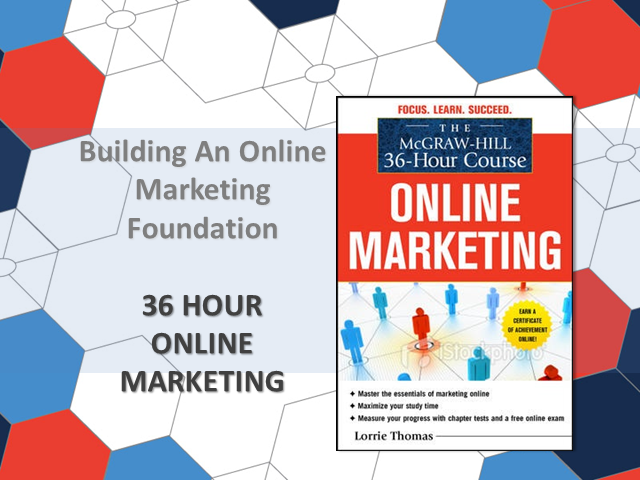 Grab your virtual map and get started with the 36 Hour Online Marketing webcast series. This launch webcast: Building An Online Marketing Foundation covers what online marketing REALLY MEANS and show how the most important computer to use for web success is the three-pound information processor in your skull. The three online marketing rules for success will be taught. Attendees will walk away knowing what questions to ask to have a greater edge on how to create and execute an online marketing strategy. Online marketing is not something one spends time or money on. It is something that (when done well) becomes an investment. Let's get learning! Online marketing has evolved far beyond flashy websites and banner ads shouting at customers about your product. It's about using an array of Internet tools to build credibility and visibility, spread your message, and form meaningful customer relationships. Get on the fast track to harnessing the power of the Web for your marketing goals. It begins with planning and building a website and then provides in-depth coverage of essential online marketing tools and techniques, such as content marketing and blogging, social media marketing, web analytics, search engine optimization (SEO), e-mail marketing, and online public relations. Lorrie Thomas, MA is a web marketing speaker, strategist and trainer. She is the CEO of Web Marketing Therapy, a marketing agency that offers strategic advisory services, online marketing training and marketing management.